This is an old page please use the link above. This version is designed to support Mac OSX 10.8 and above and requires OpenBabel 2.3. Version 2.6 can still be downloaded from here. Noel O’Boyle has written a brilliant introduction to OpenBabel. 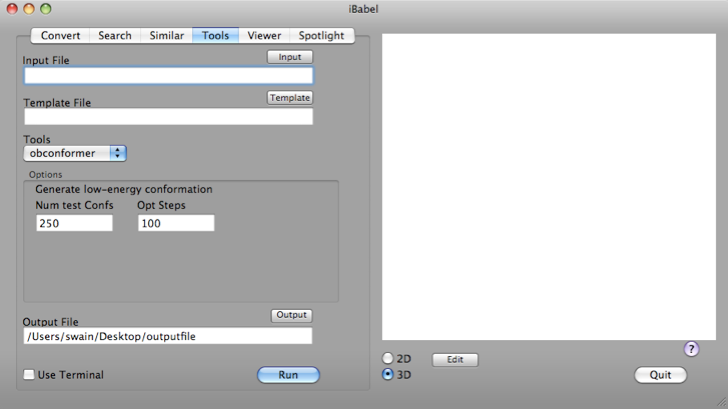 This is an Applescript Studio Application created using Xcode, it is a GUI for the command line driven file conversion application OpenBabel. The application is available iBabel and the documentation is available. If anyone wants the source code drop me an email, everything will be uploaded to Sourceforge when I have time. You can read more about it in this issue of CDK news page 19.
iBabel was designed to be the interface to OpenBabel and it provides a simple GUI for file conversion and manipulation and supports over 80 different chemical file formats. 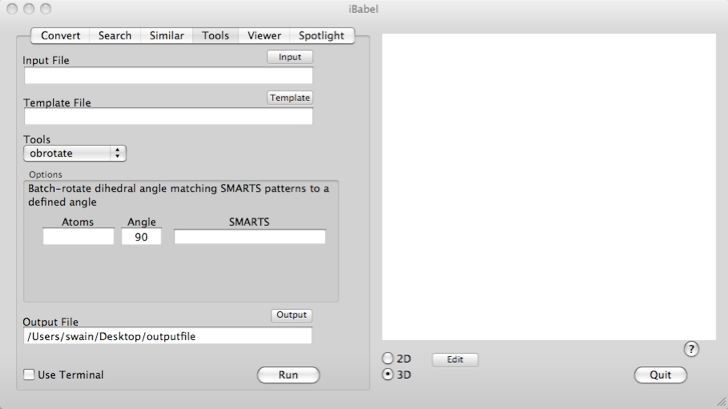 It also provides to a number of tools built using the OpenBabel toolkit, these include very fast substructure and similarity searching using a variety of molecular descriptors, don't worry if you can't write SMARTS queries there are a range of predefined queries available from the drop-down menus and you can use the embedded editor to create more. 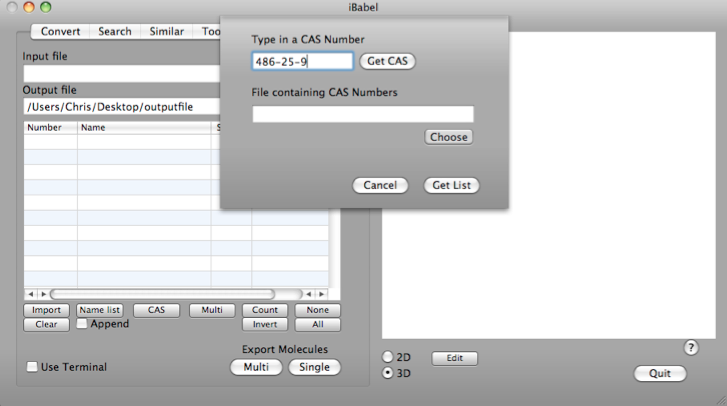 - A new feature is the ability to get the structures corresponding to CAS Numbers from PubChem. It uses the the Entrez Programming Utilities (eUtils). If it proves useful I can look at adding further search facilities using PubChem. You can view more details here. The embedded tools also give access to molecular property calculation, molecular rotamer generation, and energy minimisation. Embedded tools allow the user to overlay structures on a template defined by a SMILES string, print chirality or property information. For the 2.6 release of of iBabel, the major aim of the new version was to provide access to the new command-line tools that are available in Open Babel 2.2.0. To find out more about the new capabilities of Open Babel 2.2.0 have a look at the release notes here. To access the tools you will need to download the latest version of Open Babel from here. 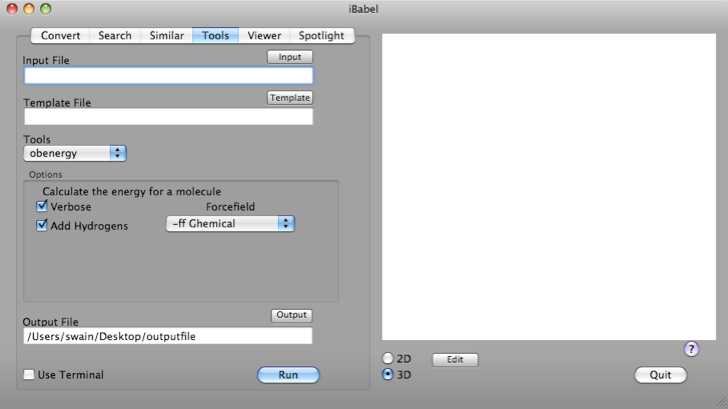 If you want to use the Chemdraw plugin (ChemDraw plugin is broken under Snow Leopard, I’ve informed Cambridgesoft) or Marvin as the molecule viewer/editor you will need to download them also. The increasing number of tools has meant I've had to rethink the User Interface for the "Tool" tab, and I'm particularly grateful for the input from Alex Griekspoor and Philip Buckley. The way I've set up the interface is the input that is common to most tools (input/output files) I've left in the main tab, the input that is unique for each tool appears in the box when the tool is selected from the dropdown menu, as shown for a selection of the tools in the images below. One of the advantages of this arrangement is that as new tools become available via OpenBabel I can add them without having to rethink the interface. I just need to add a menu item to the tools menu and an additional options box that will only be displayed when the menu is selected. The structures can be viewed in 2D or 3D as appropriate using the embeded Jmol or JChempaint applets in addition iBabel also supports the use of Marvin from ChemAxon or ChemDraw from Cambridgesoft. I’ve now added the ability to search using the excellent ChemSpotlight created by Geoff Hutchison this means you can search your hard drive for chemical content. 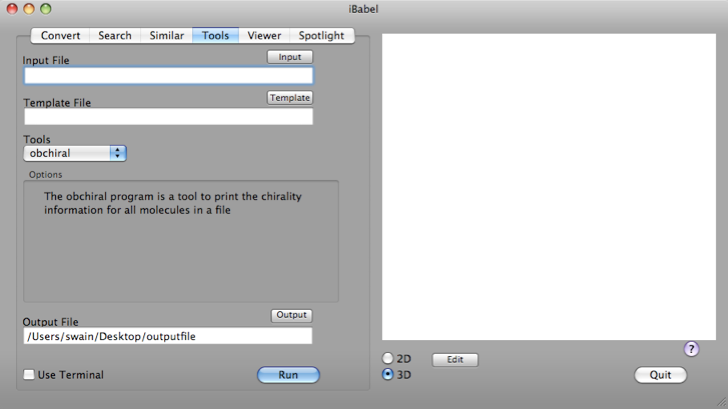 Remember you need to install ChemSpotlight to access all functionality, the download here will also install OpenBabel. The full documentation is available here. If you are using Mac OS X 10.5.x you will need the latest version of ChemDraw to use the plugin in the viewer, it can be downloaded (59 MB) from the support downloads page. Marvin from ChemAxon works perfectly! The latest (20 Aug 2009) version is 2.6 and can be downloaded from here. This is a minor update (26 Feb 2008) that fixes an issue where the viewer displays HTML code rather than the structure, this seems to only effect a very limited number of users but the fix should avoid the problem in the future. You can download the new version here. 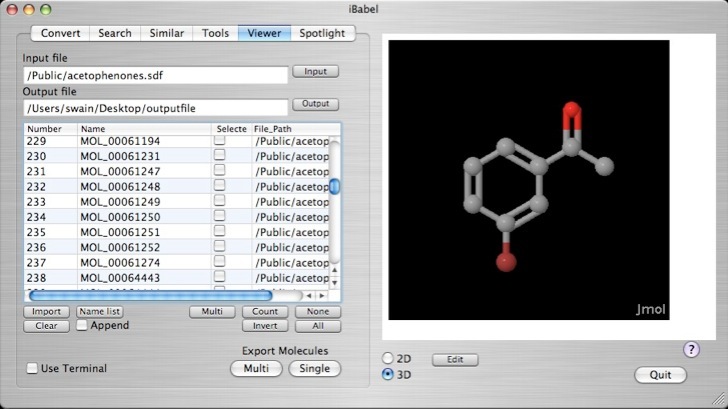 iBabel 2.5.1 This is an updated version of the cheminformatics tool iBabel (19 February 2008), this minor update improves compatibility with Mac OS X 10.5 particularly on Intel machines. I've also modified the CAS Number lookup from PubChem, very many thanks to the guys at PubChem who showed me a more reliable way to get the appropriate SMILES strings and how to avoid the formatting issues. 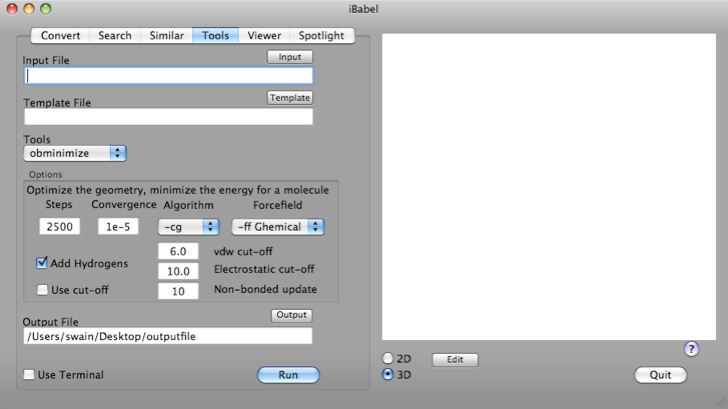 If you are using Mac OS X 10.5 you need to install ChemSpotlight to access all functionality, the download here will also install OpenBabel. The full documentation is available here. If you are using Mac OS X 10.5.x you will need the latest version of ChemDraw to use the plugin in the viewer, it can be downloaded (59 MB) from the support downloads page. Marvin from ChemAxon works perfectly! The key new feature in version 2.5 is the ability to get the structures corresponding to CAS Numbers from PubChem. It uses the the Entrez Programming Utilities (eUtils). If it proves useful I can look at adding further search facilities using PubChem, there are more details about the CAS lookup and screenshots here. This version also improves compatibility with Mac OS X 10.5 (Leopard). You can download the new version here, or from either MacUpdate or Versiontracker. To get a better idea of the capabilities of iBabel have a look at the screenshots.